An Interview with mobileWOMAN, Maryanne McCauley About her Helper Monkey, Jessica! MW: Please tell us a little about yourself. MM: My name is Maryanne McCauley and I am a T11 paraplegic woman. I have been a para for almost six years due to a spinal cord injury as a result of a blood clot on my spine. My son was a senior in high school at the time of my injury – now he is a US Naval Officer. I am a single mom, and now I find myself an "empty nester". MW: What is your disability and capabilities? MM: It's strange because I never thought of my circumstances as disabilities and capabilities just a different way of accomplishing different activities. But if I had to get technical, I suppose I would say I have complete use of my arms, my legs are another story. I do have some movement and sensation in my legs, however I cannot bear weight or walk. I am completely reliant on my wheelchair. I tend to drop things a lot, and some doors give me difficulty, my balance is so-so which means sometimes I have difficulty reaching for something such as stretching into the mailbox to get out the mail or reaching a light switch. My legs spasm often, and sometimes my feet slide off my foot plate. MW: How did you hear about helper monkeys? MM: While visiting family, a relative mentioned it in passing and I was intrigued. I decided to search the web to see if there were actually service monkeys...it certainly made sense. MW: What made you decide to get a helper monkey? MW: Please describe the process in obtaining a monkey? MM: Applying for a monkey helper involves more than just filling out some paperwork. From the very beginning, it is a mutual commitment from applicants and from Helping Hands to get to know and understand each other very well. 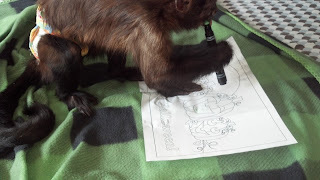 If an applicant meets all of the program’s eligibility requirements, he/she will be sent a formal written application, a request for personal and medical references, and finally instructions on how to make a video of their home environment and the tasks that they hope a monkey can help with. Throughout this process, phone interviews are conducted which also allow applicants to ask questions about the program and what life with a monkey is like. 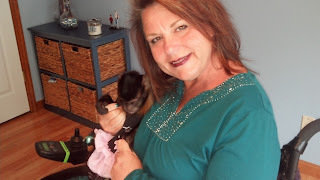 In most cases, Helping Hands will conduct an in-home interview to speak with an applicant and their family/caregivers about the responsibility and commitment sharing their lives with a service monkey will require. In general, the application process takes between 3 and 6 months, but it is longer for others, like me. MW: How long does the entire process take? MM: It took me 2 years from my first inquiry, to the day they knocked on my door and brought Jessica to me. The application process has a number of steps, but it is important that they really get to know you during the process so they can find the right monkey – it’s like a dating service...they want to make sure it’s a good fit, both personality and skills wise. Helping Hands has more than 30 years of experience with the types of candidates and home environments that are appropriate for a monkey helper, and the types of recipients who are able to provide a monkey with long-term care that meets their standards. MW: What does your monkey do for you and what are their capabilities? MM: Jessica is such a good helper! I like to be as independent as possible, and she helps me accomplish just that! I have my cell phone with me at all times for emergency purposes, but I tend to drop stuff a lot and it’s not too safe for me to lean out of my chair to try and pick things up....but guess what? Jess hops down to the floor and "fetches" for me! She loves the outdoors and likes to wait outside with me for the mailman to come. She likes climbing inside the mailbox to hand me the mail. She also knows "push" to open doors, or "close" to shut the door. I also use the push command to have her "push" my foot back on the foot plate when my foot spasms off of it. Jessie is a great confidant when I'm feeling blue. I can tell her things to get it off my chest...and she never tells a soul. She's very entertaining and makes me laugh all the time. Just what this "empty nester" needed! I like to do all sorts of crafts so I got Jess some waterproof, non-toxic markers...she likes to make her own masterpieces. If I were a quad, Helping Hands would have matched me with a monkey that was trained to help me with other tasks, such as turning a page in a book, scratching an itch on a face, or pushing glasses up on a nose. Jessica enjoying a bubble bath. MW: What kind of care does the monkey require? MM: I won't lie. 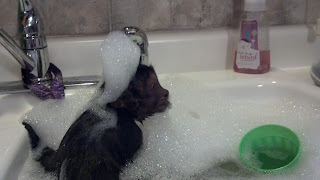 There is a lot a care that goes into having a monkey...I feed her several times a day, her cage gets cleaned (I have someone help with that), and I give her baths a couple times a week. She really enjoys them so we do it often as a way of bonding. This puts me back in the care givers seat, instead of the one receiving the care. It makes me feel useful and it takes my mind off of my pain, if only for a little while. MW: How does she go the bathroom? Does she require assistance? MM: Some of the monkeys will go to their cage when they have to go to the bathroom. Jessica does not so while she's out of the cage she wears a diaper. I cut a slit in it for her tail. If we're outdoors, I don't diaper her. Her cage is her "safe" place...her room...her food and water are available to her there. It's the size of a refrigerator and was given to me as well. This truly is an amazing program! MW: What is the lifespan of a helper monkey? MM: Monkeys in captivity could live 35 to 50 years because their diet is monitored and their sugar intake is kept low, whereas is in the wild, they take in a lot of sugar via berries and die of diabetes. Jessica is 26 years old. MW: What are the positives and negatives of having a helper monkey? MM: The positives....independence, companionship...I'm always smiling when I’m with Jess. She loves snuggling at the end of the day while I’m in bed watching TV. I can't think of any negatives...I just wish I had her sooner! MW: Can the monkeys ever be dangerous? MM: I have never felt anything but safe in Jessica's presence. She's very protective of me because I am her alpha person and she relies on me as much as I rely on her. Helping Hands has years of experience in training recipients and their families to understand a service monkey’s complex hierarchy and setting up environments where monkeys will feel safe and secure. It’s my responsibility as Jessica’s recipient to make sure I provide her with that environment so that she always feels protected and happy. MW: Would you recommend a monkey to others and if so, do you know any resources for those thinking about getting a monkey? MM: It doesn't cost the recipients anything to get a helper monkey from Helping Hands! The organization relies on donations in order to cover all costs, so if you know of anyone looking to donate money to a worthy program, tell them to look no further. They are the only organization in the world that does this kind of work and they place monkeys with people like me all over the United States. I absolutely would recommend this program - it has made such an impact in my life. MW: Is there anything else about Jessica that you could tell us? MM: Jessica keeps me completely entertained. In warmer weather, we spend a lot of time in the garden. She likes to smell the flowers and hunt for bugs. She loves spiders...when she catches one, she'll treat it like a daisy pulling the legs off..."she loves me...she loves me not" eating each leg as she goes, the pops the body in her mouth! 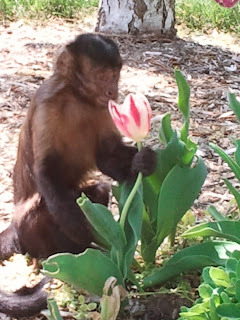 For more information about obtaining a helper monkey, please contact www.monkeyhelpers.org or for specific questions contact Maryanne at maewestoftherockies@gmail.com. Good to ready this type of blog ! Worth a read !